H Carl Ott and Michael Barile recently released the GEN II version of their fabulous MOD-6_7971 Nixie clock, and I ordered several kits from them. The new version adds GPS time synchronization, either via a GPS receiver plugged into the back of the clock, or by using an RF-Link repeater module which talks to the clock over short-range 2.4GHz radio. This clock uses the B-7971 Nixie tube, which displays alphanumeric characters 2½” tall. The RF-Link lets you completely avoid the problem of needing to position the clock within a few feet of a window or resort to using a bunch of PS/2 extension cords. Now you can put the clock exactly where you want it. The RF-Link remote also includes an indoor temperature sensor and a pushbutton which can be used to remotely turn the clock display on and off. I have a separate page here describing the clock, but I’m adding a link here so people can find it, and also to facilitate comments (while the actual clock page doesn’t support comments, you can comment here). 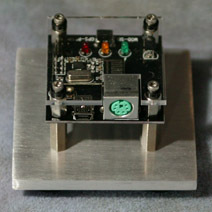 For more info or to order a kit or assembled clock, visit the MOD-6 page at BadNixie.com. This entry was posted on Monday, February 6th, 2012 at 11:17 am	and is filed under Clocks, Computers, Raves. You can follow any responses to this entry through the RSS 2.0 feed. You can skip to the end and leave a response. Pinging is currently not allowed. problem is that I cannot find any B-7971 tubes ( search ebay on a daily basis ). of the tubes are in the USA. All of my tubes are in use. I purchased them at various times on eBay. I see 4 listed in the UK currently (item 220953104146), but at a bit of a price premium compared to US prices. They do have the advantage of being tested and shown working, though. You might try asking on the neonixie-l Google Group – sometimes some of the people there have ones they’re willing to sell, but don’t advertise that in public. I had completely missed that listing !